As the days start to slip away one by one towards our fair, so do the dwindling number of stalls that are available. All stalls are 2000 baht and if you would like to rent one, or more, please go to this link: http://www. care4kids.info/rent-a-stall.html. If you have any inquiries, you can call our fair site coordinator, Bill, at: 0899303558. For those who still do not know where the Regents International School Pattaya is located, it is right next door to the Banglamung Motor Vehicle Registry Office, where driver’s licenses are also obtained, off Highway 36. Yet another landmark is the Pattaya Sheep Farm, which is directly opposite from the school. Recently, we provided funds for additional toilets to be built at Santikam School in Nong Plalai. Nevertheless, we will also supply shuttle buses from Pattaya Klang on Sukhumvit Highway in front of the Father Ray’s Foundation, which is just before the Boontavorn DIY Store. Otherwise, even though we are preoccupied organizing our fair, we still take the time to keep on caring for kids. 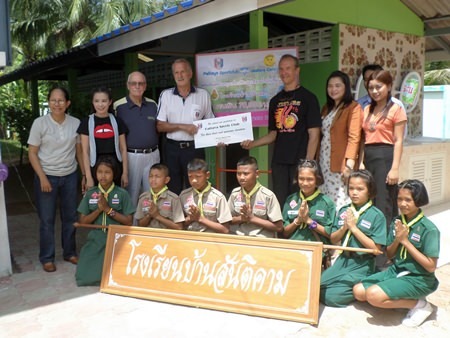 Recently, we provided funds for additional toilets to be built at Santikam School in Nong Plalai on the east side of Highway 36 with our friends from like-minded organizations, namely William and Nigel from the Pattaya Sports Club and Noy from the YWCA. At this school, PSC and Jesters covered the toilets, while YWCA built a mushroom house for them. Working together like this helps us have a bigger impact on needy children’s projects. For more info about our events and projects, please visit us at www.care4kids.info and/or www.facebook.com/jesterscare.forkids.